-------------------------------------------------- Due to the size of the application, the download may take a considerable amount of time to complete. The app uses 3.9GB of space. When downloading the game for the first time, you must have more than 4GB of space available on your device. Version updates for the app will use more than 4GB of space. Please ensure that there is plenty of space available on your device before downloading. 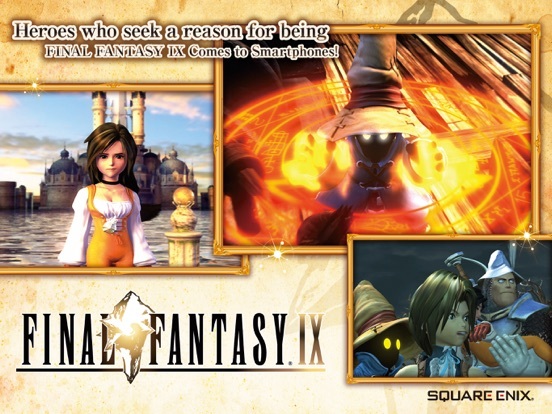 -------------------------------------------------- ■Description Selling over 5.5million copies since its release in 2000, FINAL FANTASY IX proudly returns on iOS! 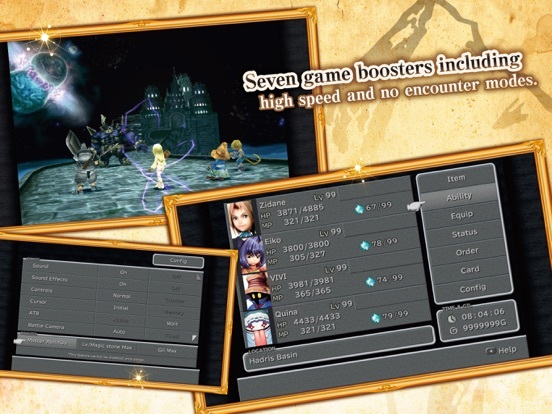 Now you can relive the adventures of Zidane and his crew in the palm of your hands! 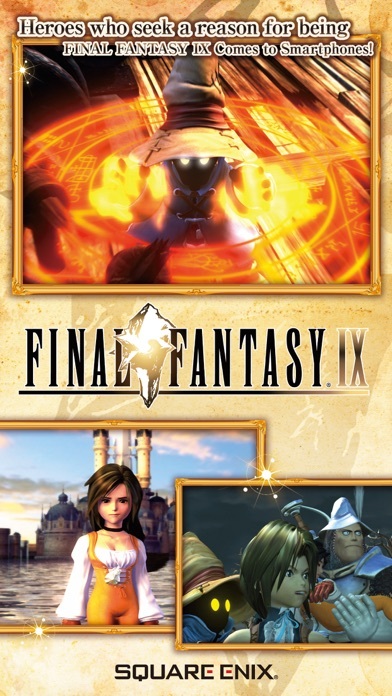 Enjoy this classic FINAL FANTASY experience with no additional fees or purchases. 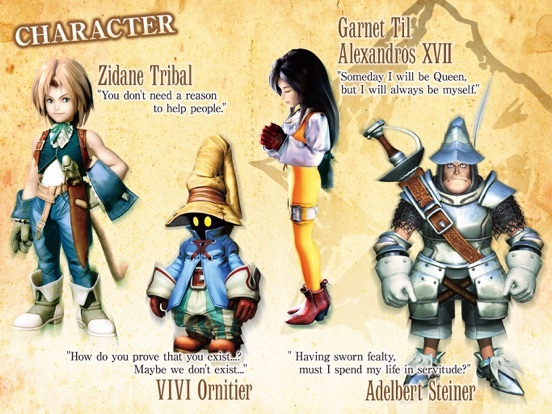 ■Story Zidane and the Tantalus Theater Troupe have kidnapped Princess Garnet, the heir of Alexandria. To their surprise, however, the princess herself yearned to escape the castle. Through a series of unusual circumstances, she and her personal guard, Steiner, fall in with Zidane and set out on an incredible journey. 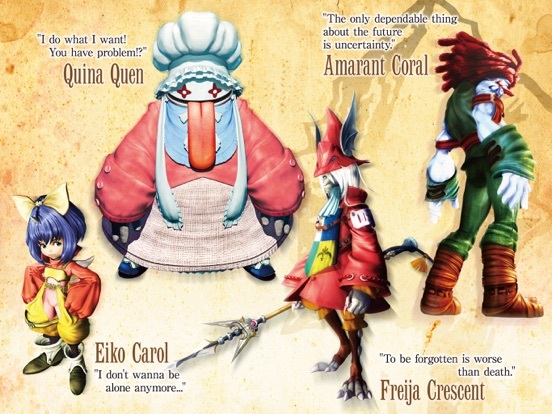 Meeting unforgettable characters like Vivi and Quina along the way, they learn about themselves, the secrets of the Crystal, and a malevolent force that threatens to destroy their world. 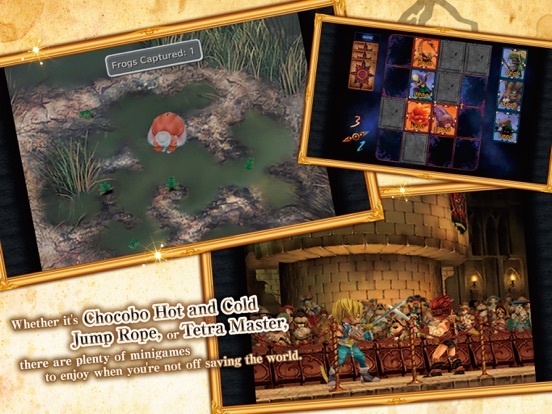 ■Gameplay Features ・Abilities Learn new abilities by equipping items. When fully mastered, these abilities can be used even without equipping items, allowing for nearly endless customization options. ・Trance Fill your Trance gauge as you sustain hits in battle. When fully charged, your characters will enter Trance mode, granting them powerful new skills! ・Synthesis Never let items go to waste. Combine two items or pieces of equipment together and make better, stronger items! 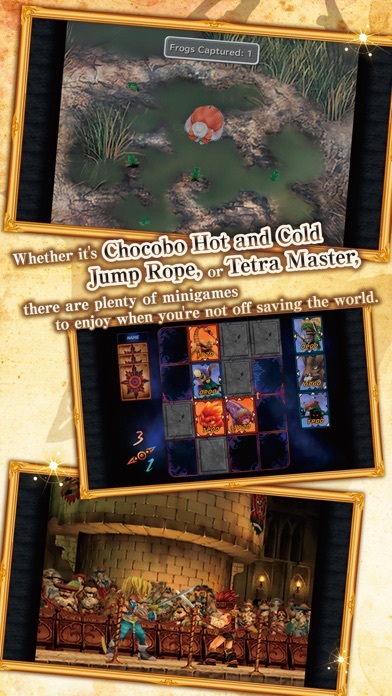 ・Minigames Whether it's Chocobo Hot and Cold, Jump Rope, or Tetra Master, there are plenty of minigames to enjoy when you're not off saving the world. You can even earn special item rewards! 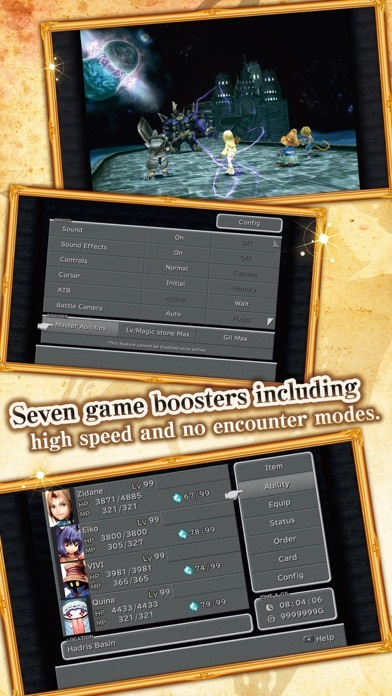 ■Additional Features ・Achievements ・7 game boosters including high speed and no encounter modes. 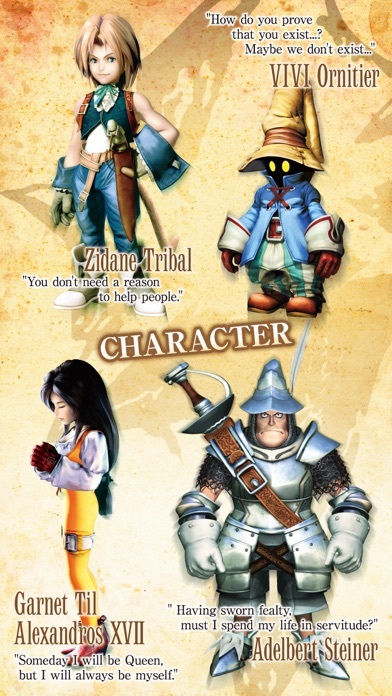 ・Autosave ・High-definition movies and character models. ーーーーーーー Operating System iOS 7.0 or later Recommended Devices iPhone 5s, iPhone 6, iPhone 6 Plus, iPhone 6s, iPhone 6s Plus iPad (4th Generation), iPad Air, iPad Air 2 iPad mini 2, iPad mini 3, iPad mini 4 iPod touch (6th Generation) We cannot guarantee proper performance on devices other than those listed above. Please confirm your device model before downloading this app. 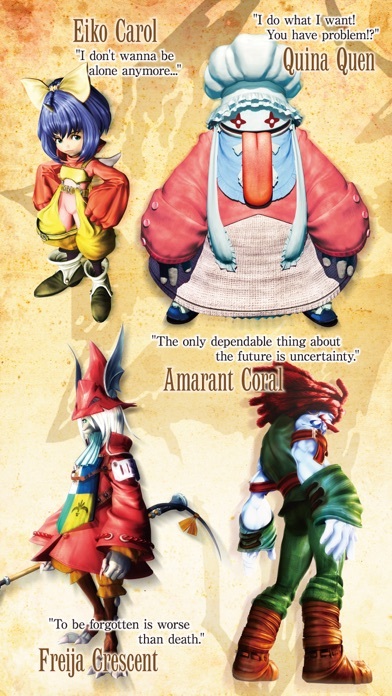 'Final Fantasy IX' Is Now Available Worldwide - Surprise! Heavenstrike Rivals – A Monster Tactical TCG!